The term “Micro moments” is Google’s new narrative which pivots around how we as users behave online. We experience the world in both online and offline in moments; just like life, moments are varied. You break a window at home for instance, and then you are online within seconds trying to find a replacement and fitter. This would be an “oops-I-really-need-to-fix-this” moment, and essentially until that moment is resolved, it will consume all of your attention. Similarly, you could be starting your Christmas shopping in town and have no idea where to start… Out comes the mobile phone, open the browser ,and enter “gift ideas for Mum”… that is a “I-am going-to-be-in-trouble-if-I-don’t-get-something-great” moment. Google are using the “micro moments” narrative to try and get advertisers thinking beyond the functional search terms that drive people to a site in order to buy a product. The idea is to think about the context and the journey the user takes before purchasing. There are a lot of untapped opportunities within these moments which I will expand on in a moment. Secondly, to show their suite of solutions for all these moments, these include: Paid search with app downloads extensions (Nike), Product listing ads (hair dryer), YouTube (car fix), maps (ice cream shops) and map ads, my business knowledge cards (Staying for the finals), which are shown in the video. It therefore seems that Google do have a solution for pretty much anything, and are developing a multitude of ways to reach users in a more meaningful manner. So, back to those untapped opportunities! I recently had a micro moment of my own: she is called Ella, and recently had her 1st Birthday on the 6th of November. I remember the joy/panic I went through when I found out I was going to be a Dad; it started a journey for me, where I was Googling anything and everything slightly baby related! Here is a simple example of how as advertisers we can be there for those moments. After the initial panic has disappeared and you reach month 2-3, what do you start thinking about? Baby names of course! And where do you go for ideas? Google! 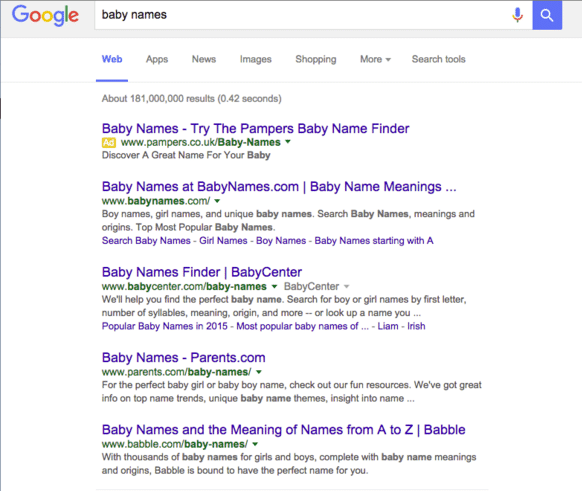 Now, it is pretty safe to assume the only people likely to be searching for baby names are those who are likely to be having a baby. This is an opportunity for people selling baby products to reach people early on in the moment. You don’t have to be selling baby names, you can be selling anything related to babies, and this could be your opportunity to introduce customers to your brand. There is only one company advertising on this term, and that’s Pampers. So, well done to Pampers for understanding the user journey and for trying to connect with future customers early in the moment. This is just one example, but there are literally infinite opportunities out there for brands to truly understand the customer journey and meet people in the moment. Are you doing something creative like this? Shout about it! Let me know what you think of the Google video, does it capture the situation well?